Who are you? I’m Lou, owner of Showtime Retro and I’m passionate about Mid Century furniture and lighting, Industrial, vintage curiosities. My name is Ivor Warton-Woods. I am a Londoner, a dealer, musician and amateur social worker. Why Ramsgate? Lou -The people and the place. Ivor – I left London in the year 2000 after finishing in the recording studio business moving to a small, quiet coastal town that other escapees from London had recommended. First Ramsgate memory? Lou – Dodging a low flying seagull, ended up on Ramsgate shores! Ivor – A school outing. We had built a small hovercraft at school and the school were invited to Ramsgate Hoverport accompanied by a TV crew to ride in the big hovercraft, and to have our small craft filmed emerging from its mouth. The enduring memory was not pride in the school’s achievement but the stench of sickness and cries of the overwhelmed children as the hovercraft battled rough seas to France. If you were an animal, what would you be? Lou – Loggerhead Sea Turtle, Caretta caretta; the only living species to survive which were contemporaries of dinosaurs, but are now endangered. Ivor – I would be a mosquito in No.10 spreading malaria to the P.M. and Cabinet.Then watch them being assessed for benefits. How do you define style? Lou – It’s ‘Showtime’! Eclectic, colourful, movable feast. Ivor – Style is the combination of inner beauty, love and emotion. Favourite place to eat locally? Lou – The Dalby Cafe, Margate, for breakfast, Ship Shape, Ramsgate Harbour, for lunch on the go and Yama’s Cafe, Margate for a Thai feast for the senses with friends. Ivor – Belgian Bar in Ramsgate. What couldn’t you live without? Lou – My grandmother’s paint encrusted artist’s palette (and my champagne gold retro merc!). Ivor – The grand piano. Best advice you’ve been given? Lou – If something sings to you, it will sing to others. Ivor – There’s no point to anything in life, that’s the point in life. Object of desire? Lou – The boundaries between stock and personal possessions are always blurred! I enjoy the ebb and flow of Mid Century finds and never knowing what’s round the corner, and then passing them on. Ivor – The boat moored next to Arch 15, The Seahorse. What is the best thing about your job? Lou – Being your own boss and having the opportunity to share a unique space with two very creative and inspiring individuals. Ivor – The people, the proximity to the sea. What building would you like to be locked in overnight? Lou – Moonbow Jakes’ Lido bar and performance space in Margate…straight out of a Tarantino film. Ivor – I don’t like imprisonment however I would enjoy the Picasso Museum in Barcelona. Where do you go for a nightcap? Lou – Feet up in Arch 15, overlooking a starry Ramsgate Harbour, listening to boats clinking at 1am, when working late with Thomas. Ivor – My balcony or maybe the Belgian Bar. What would you buy if you won the lottery? Lou – Cheese….er, vintage (vintage in italics) cheese obviously. Ivor – I would buy the Ramsgate Pavillion on the seafront and create an arts centre. What do you collect? Lou – Madam, I don’t collect…I acquire! Ivor – Collecting is a mental illness….but we love collectors. I do accumulate stock and enjoy it before selling it. Who are your heroes? Lou – David Attenborough and Tim Nevard’s family, an old boss, who set up the www.mareebawetlands.org a community led organisation, which regenerated the Mareeba Tropical Savannas and Wetlands, creating a sanctuary for savanna and wetland wildlife and cultural heritage in Queensland, Australia. Ivor– People who look after other people…but also Theodorakis, Beethoven, Morrissey, Leonard Cohen, Johnny Cash, Picasso, Iris Murdoch, Jane, Tracey, Thomas, Lou…………my Mum. Best and worst thing about setting up your shop / business? 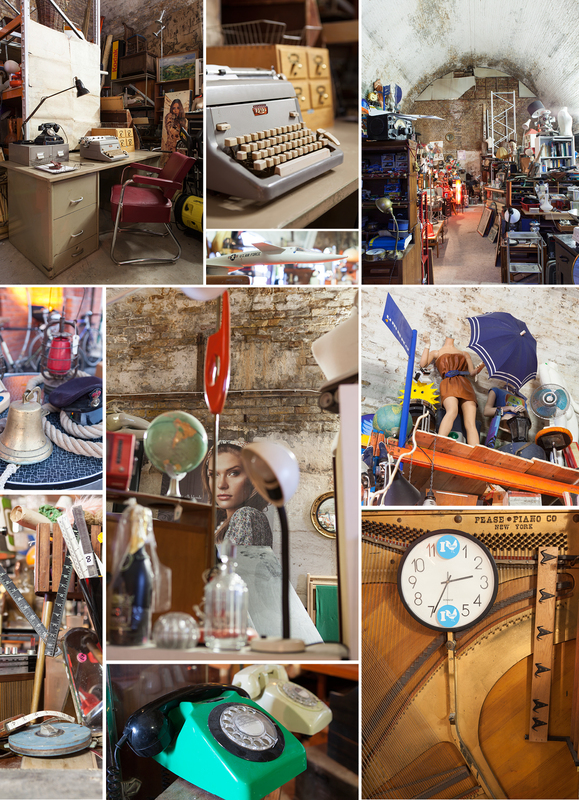 Lou – It’s an ever changing stage set in a beautiful industrial building at the heart of Ramsgate’s Harbour community. The unpredictable yet exciting weather rolling in across the sea (occasional shortage of bubble wrap to insulate boots). Ivor – The best is the happy reaction from everyone. The worst is working every Sunday. What’s the most unusual item that’s come through your door? Lou – Godamn pigeons! Ivor – An 18 string guitar. Describe your perfect day. Lou – Sunshine and fry up, followed by throwing open the doors at Arch 15; listening to Ivor & Thomas on the grand piano, sourcing retro treasure and seeing who walks in the door. Ivor – Every day that I’m alive and make as few mistakes as possible. What would you do if you were mayor for a day? Lou – Create more apprenticeships and retro skate parks for young people. Ivor – If I were the mayor for a day, I would hold a seafood banquet accompanied by cabaret in Arch15 for local carers. What are your goals for 2013? Lou – Get involved in some local conservation work, relax at the new Absynthe Bar at the Tom Thumb Theatre, Margate and have a holiday snorkelling! Ivor – The goal for 2013 is to be good. ROUND-UP: Showtime Retro & Arch 15 can be found tucked away in the victorian arches under Royal Parade, Ramsgate. In the heart of the bustling harbour is an arch packed full of Antique, retro & vintage oddities, curiosities & midcentury gems that by day spill out on to the harbour enticing you in to shop. Inside Ivor plays the grand piano to wile away the afternoon, giving you the perfect soundtrack to shop to – A vintage heaven with a musical twist. 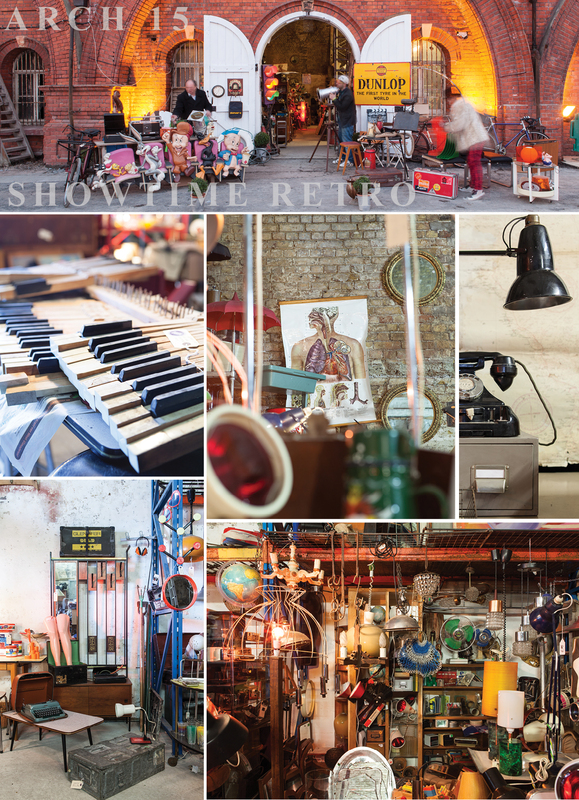 WHERE TO BUY: Showtime Retro & Arch 15, Military Road, Royal Harbour, Ramsgate. WHERE TO EAT: Dalby Cafe, 4-6 dalby road, cliftonville, Margate. The Belgium Bar, 98 Harbour Parade Ramsgate.